Painting outdoors from life is probably the hardest painting there is. In addition to the usual studio challenges, there is the vastness of choosing what to paint, the difficulty of creating a good composition on the spot, the ever changing light, the heat and humidity of this particular environ, and of course, the distractions - like bugs and other fauna, interested onlookers, and the added potential mishaps. A couple of personal mishaps come easily to mind. Once I set up VERY close to the edge of the marsh at high tide. 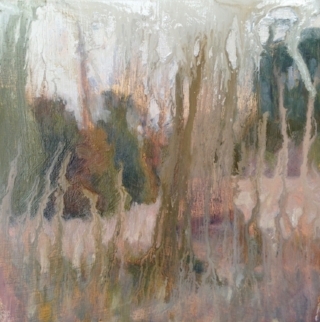 When I completed my painting and was taking down my easel, the whole works fell into the creek! The drips of the the salt water mixed with paint completely destroyed my effort. Fortunately, a good friend loved the drippy design and we traded paintings - all was not lost. I think I got the better end of that deal! Another time, I was packing up and placed my finished painting on the hood of my car whilst putting the rest of my stuff in my car. You know where this is going. Yes, I drove off, the painting fell into the street and was run over by at least twenty cars. When I retrieved it, there was only the ghostly outline of what I had painted. Ugh. There are plenty of days I came home without a painting at all because I wiped off what wasn't working. I think I might hold the record for wipe offs in my weekly plein air group - five times! Having a group is not mandatory but the camaraderie is definitely a bonus. Everyone has a bad day now and then so it is easy to support and feel supported. Having an on the spot critique is invaluable as well. And, on particularly hot, humid days, everyone is sweaty and stinky together.